I know Lance has been removed from build, but I really hope it'll return. It's my fav map, and I've made a Concept for it. Last edited by codexe; 03-20-2017, 01:17 PM. I love Unreal, and I love art. Being in paradise..
WOW ! Very nice work dude ! Stunning concept art! Well done! This forum post was sponsored by coffee, cigarettes and procrastination at work. I tweet occasionally at @pundurs and stream embarrassingly bad game play on my Twitch. I love both map and concept! I hope the meshed version will look like your concepts! Me gusta, maybe a slightly cleaner sci-fi look would apply well as well. In any cases this smells a lot like UT, GG ! The skybox man.. love it. It sets the mood. 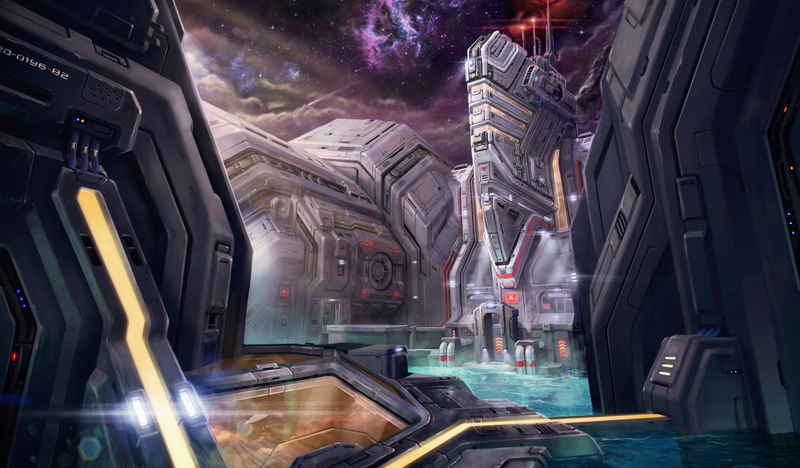 This should definitely inform some of the design of unreal tournament! The skybox invokes that old school feel while the clean lines and materials fit the newer art direction as well! Great job! Woah, three times in a row! @Flak should read the last quote, too! CTF-Lance is a somehow fan-/fun-fantastic map!! The design idea of Thomas with the underwater part, force fields to get in out the base under water, the large tower do. Jump & dive down.....THATs! Unreal!!!! Really, really hope this map will return somehow in the future and is just on hold. I even could imagine to mirror the whole map to make its layout symmetric again (for the people who think ... baääh, asymmetrical maps are bad). Still, the map is available in the UT-Editor, and maybe a talented mapper can mesh it, or even crate kind of a fun FFA DM map from it . but please don't let Lance die! Thank you guys! I really appreciate it! I just hope it'll return soon. Good work! Really like this concept! I gotta print this one. Frame it. Looks incredible, well done. As some have already said, the skybox is amazing. Just what I would expect in a UT map. Personally I oppose the blue sky/earthlike skybox featured in Outpost23. However, everything else in Outpost is great.